There's a lot happening in this picture, here’s my best attempt at explaining it in my own words while trying not making it too complicated. Most cameras can have their settings tweaked to make them very sensitive to light. 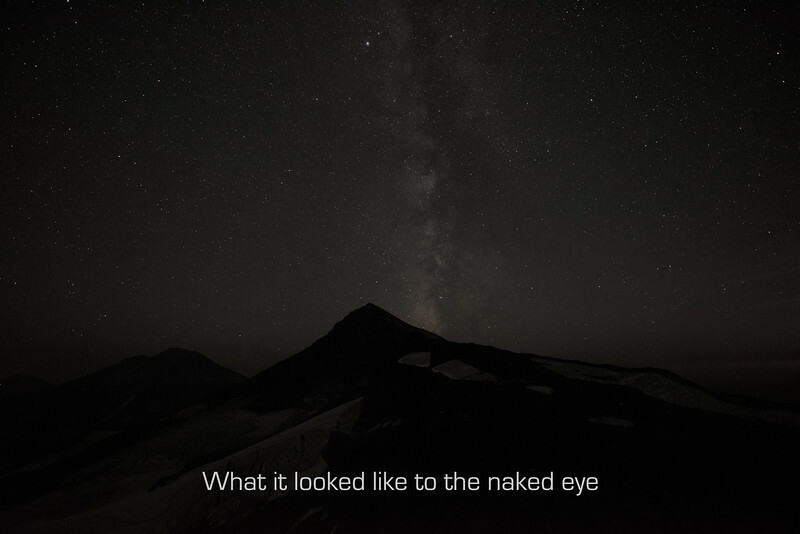 A properly exposed night picture (especially a huge panorama like this) will reveal details and beauty of our nighttime world that most likely will have been hiding in plain sight. It’s like using night vision goggles to see in the dark. It’s not cheating by altering reality, it’s just using technology to gain a perspective on reality that you’d normally be blind to. What are the fluorescent green and blue patterns warping through the night sky? It's called AIRGLOW, it's happening 60 miles up in the atmosphere, and it's really cool! I did a brief write up on it if you're interested in science. 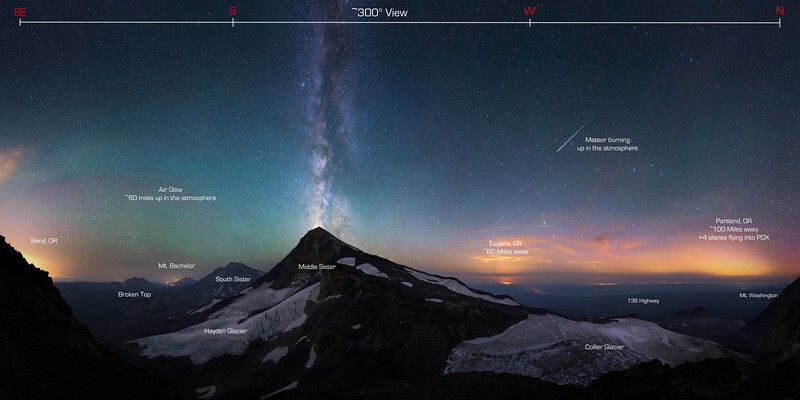 The sky and foreground are each a series of 7 photographs manually stitched together to represent the 300° field of view I had from the near summit of North Sister that night. Nikon D810 (full frame sensor body), with a high quality wide angle 14mm (14-24mm) glass nose. It’s a bit of a drag on of text but I do want to share some of my thought process behind the photograph and shooting style that works for me in hopes it can work for others who are interested in astrophotography as well. As soon as it was dark and the stars were out it was immediately apparent how special this night was going to be. More fire smoke, this time blowing northbound from the Crater Lake fire had settled into the lower mountain valleys. The smoke helps lights from cities, cars, fires, etc, deflect outwards and it becomes extremely glorified when captured over a 4 minute exposure from a really sensitive camera. I spent the first 1 ½ hours of darkness practicing shooting; Dialing in what camera settings the scene called for as well as really studying the foreground to understand where the light sources were coming from. This helps me mentally compose and visualize what the finished “ready for print” image is going to look like. The Galactic core of our galaxy is an amazing sight to stargaze upon. Over the course of the night, the Earth will spin our view of it across the entire sky. This means the glowy galactic core that’s so beautiful in astro photography will move across the horizon and even change angles as the night progresses. This time of year (September, October, November) you are able to view it from a perspective where it looks completely vertical shooting out of the horizon, keeps directly overhead, then tucks away behind the horizon at your 6 o clock. Henry and I chose to sleep on North Sister where we were that night. Research and prior terrain experience from the area had told us the band would eventually crest vertically over middle sister at ~22:00 Sep 10th from these coordinates (where we slept). Scouting trips pay off sometimes! The time was eventually right and the disc of our galaxy erupted out the summit of another ancient shield volcano (Middle Sister). 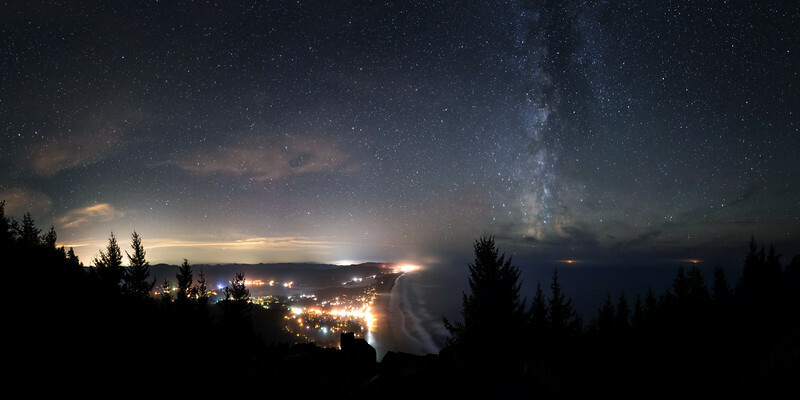 I started my final series of exposures that would eventually become this huge ~300° panoramic view of Oregon by night. Set frame, set stopwatch, start exposure, climb into sleeping bag to wait four restless minutes, get up, stumble in the rocky dark to find camera without bumping it, hope to heck the button you’re about to press is your shutter button, stop exposure, check the exposure for quality on the lcd screen by zooming in for details, pan camera to next frame with ~40% overlap, start exposure and stopwatch again, back to bed, repeat, repeat, repeat….? kill battery. Also down bags, and jackets don’t do well with volcanic rocks. I really should use a wireless remote to fire my camera, and even a very expensive panoramic tripod mount would help, but it feels natural to me to be more involved in my photographs. That stuff takes up precious backpack space and weight limits as well. It’s sometimes weeks of work and years of waiting for ideal conditions just to take a single photograph. 100% worth it. The thrill of the hunt, to actively seek and set yourself up in situations to have a chance to see the best mother nature can offer.